Olmert denies accusations, but claims his punishment shows power of Israeli democracy. 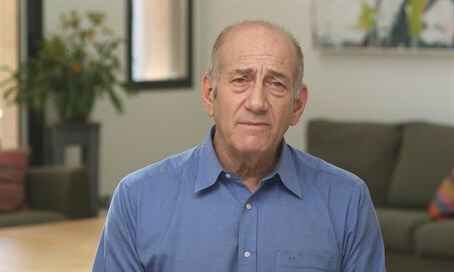 Former Prime Minister, Ehud Olmert, who is set to begin his prison term today and become the first former Prime Minister to be incarcerated in Israel, issued a video statement to the press. "During my time as Prime Minister I was entrusted with the responsibility for ensuring the security of Israel's residents, and today I will go behind bars. Once again, it is important to me to say that I completely deny the accusations of bribery. None of the charges took place during my term as Prime Minister. I served as an elected official for many years. I was privileged to take part in thrilling processes in the Israeli society. I made mistakes, although in my eyes they were not criminal and I am still paying a heavy price for some. Perhaps too heavy. I freely chose to serve as a public official. Aside from the heavy price, I have been pinned with the label of 'corrupt.' The period of my service as Prime Minister ended before its time. This is an extreme and serious step that some would say shows the strength of the Israeli democracy. I hope that many will understand that, during my time as Prime Minister, I made honest attempts to open a way to hope and a better future. A future of peace, happiness and prosperity. Life is giving me a hard test. I am going into it with great sadness. But the love, the support and the solidarity that I have received during these days will give me the strength in the future."